Junior dos Santos is a former UFC Heavyweight champion of the world and two-times former UFC Heavyweight division runner-up. Junior dos Santos is currently 35 years old according to his date of birth January 30, 1984. 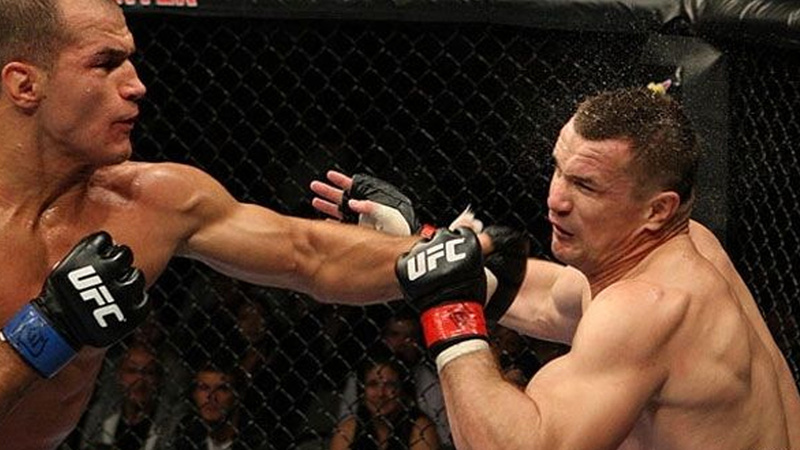 Junior dos Santos is a tremendous boxer, known for brutal knockout power. His strongest punches are a right uppercut, left cross, and weaving overhand right. He is known for his ability to break almost every guard. He usually attacks with a combo of five or more punches in a row, especially when his opponent is on the fence. He knows to throw a high kick too. Even in the clinch, he attempts hooks and uppercuts. He usually does double-leg takedown when he decides to take the fight to the ground. 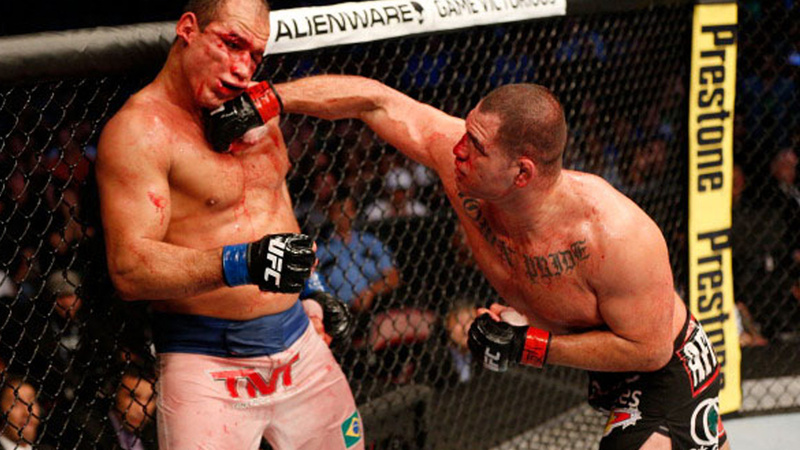 On the ground, Cigano is a very monotonous fighter – he delivers hook after hook until the referee stops the fight. Despite he is a BJJ black belt, he has only one submission victory in the career. Longest Heavyweight division winning streak – 9 wins. Junior dos Santos had his MMA debut versus Jailson Silva Santos at Demo Fight 1 on July 16, 2006, and he won the fight via soccer kick. He joined the UFC with the score of 6-1. The fastest victory of his career is the one versus Geronimo dos Santos at Demo Fight 3 – Cigano ended the fight after only 44 seconds in the first round. Junior had his UFC debut versus Fabricio Werdum at UFC 90, on October 25, 2008, in Rosemont, Illinois, and won the fight via first-round right uppercut KO, winning his first Knockout Of The Night bonus. His next opponent was Stefan Struve at UFC 94 on February 21, 2009. After a barrage of punches Cigano won the fight in the first minute of the first round! He had a tough job versus Mirko Cro Cop at UFC 103 on September 19, 2009. However, a knee from the clinch followed by a right uppercut caused damage to Mirko’s left eye, forcing him to verbally submit. Dos Santos then defeated Gilbert Yvel at UFC 108, on January 2, 2010, via first-round TKO. His next opponent was Gabriel Gonzaga at UFC On Versus 1, whom he defeated successfully via brutal left hook, winning his second Knockout Of The Night bonus. Cigano then defeated one more dangerous competitor, Roy Nelson, via unanimous decision. The two faced at UFC 117, on August 7, 2010. Despite being an underdog, Junior dos Santos defeated a former UFC Heavyweight champion, Shane Carwin, at the main event of UFC 131, on June 11, 2011, via unanimous decision. Cain Velasquez and Junior dos Santos faced at UFC On Fox 1, on November 12, 2011, in the main event of the evening. Dos Santos shocked the world when he dropped Velasquez after weaving overhand right. He needed only 64 seconds to defeat the champion and earn his third Knockout Of The Night award. Dos Santos has undergone a knee surgery after this fight due to a torn meniscus. The title shot was planned for May 26, 2012, between JDS and Alistair Overeem. Unfortunately, Overeem didn’t pass a pre-fight drug test, and his license was denied. 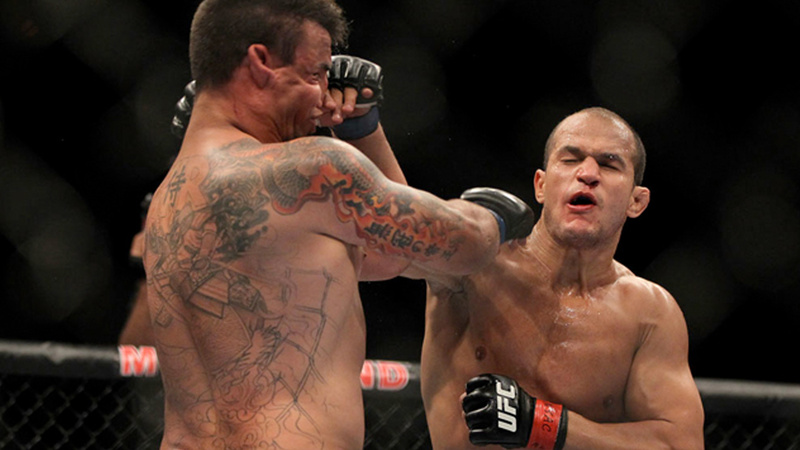 JDS was defending UFC Heavyweight title versus Frank Mir at the main event of UFC 146, on May 26, 2012. Dos Santos was extremely dominant and kept the fight standing all the time. Cigano knocked Frank Mir down with a right cross in the second round and ended the fight via a barrage of punches on the ground. 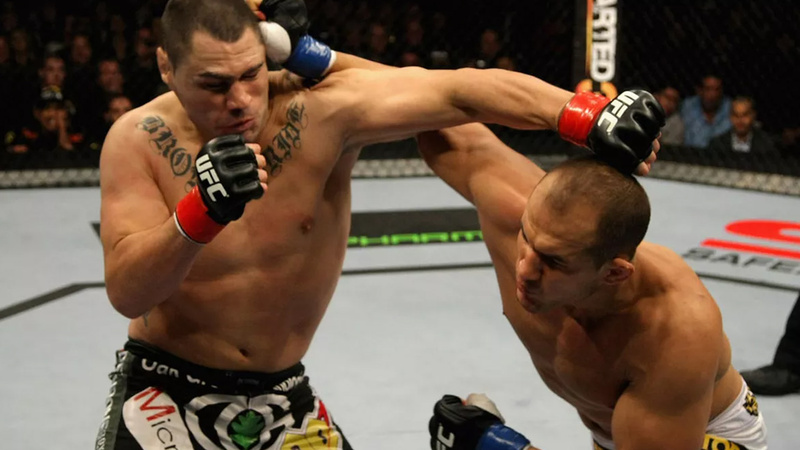 The rematch between Cain Velasquez and Cigano was set on December 29, 2012, in Las Vegas Nevada, at UFC 152. This time, Velasquez was more than convincing, and he demolished dos Santos (50-45, 50-43, 50-44), winning the fight via unanimous decision. JDS later claimed that he had developed rhabdomyolysis, a breakdown of muscle fibers into the bloodstream that affected his performance. Cigano made the biggest surprise when he knocked Mark Hunt out via spinning hook kick. The two faced at UFC 160, on May 25, 2013. Mark Hunt leaned to the right, probably trying to evade dos Santos’ jab, and he got in the way of his leg. Junior dos Santos received his first Fight Of The Night award. 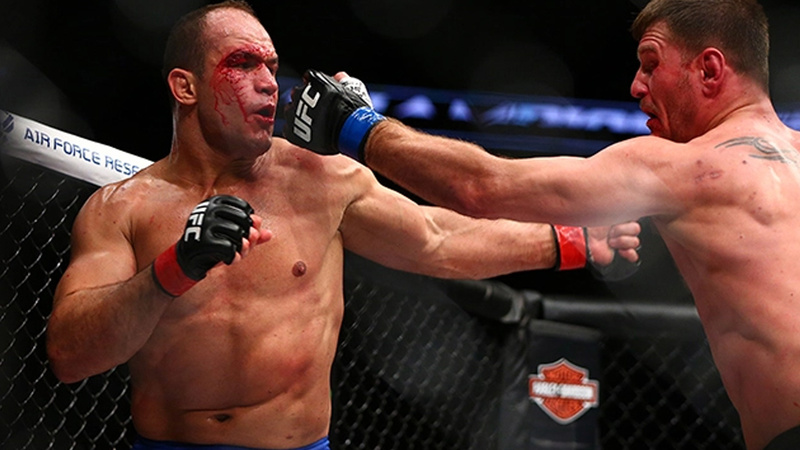 Junior dos Santos fought Cain Velasquez for the third time in the main event of UFC 166, on October 19, 2013. Cigano was fighting well for four rounds but he was still mostly dominated by Cardio Cain. Velasquez won the fight after amazing KO via slam and punch at 3:09 in the fifth round. The fight is also known for the latest finish in the history of UFC Heavyweight title fight. It was ended at 3:09 in the fifth round. 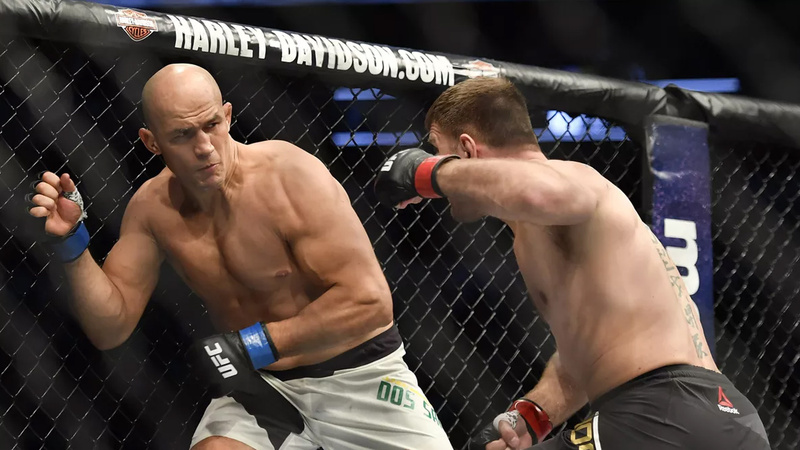 The first match between these two fighters was initially scheduled for May 24, 2014, but Cigano had to withdraw from the fight on May 5th due to a hand injury. The fight was rescheduled for the main event of UFC On Fox 13, on December 13, 2014. Dos Santos was dominating the fight with his boxing. 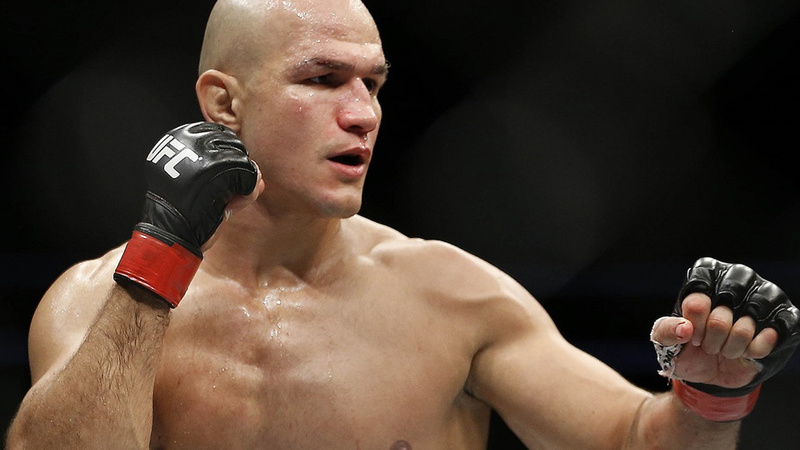 Cigano defeated Stipe Miocic via unanimous decision. Both fighters received Fight Of The Night bonuses. The fight is also considered to be one of the best Heavyweight fights of all time. Two rivals finally crossed their gloves at UFC On Fox 17, on December 19, 2015. Alistair Overeem knocked his opponent out via left half-uppercut to the chin in the second round. Junior dos Santos then defeated Ben Rothwell via unanimous decision at the main event of UFC Fight Night 86, on April 10, 2016. The second match between these two fighters was held at UFC 211, on May 13, 2017. Miocic surprised JDS in the main event of the evening. In the first round, Stipe landed heavy right hook, which sent Cigano to his knees, and the referee stopped the fight. Cigano was set to face Francis Ngannou at UFC 215, on September 9, 2017. However, he was pulled off the match due to a potential USADA violation. Dos Santos took the supplement which contained hydrochlorothiazide from the compound pharmacies in Brazil. He was cleared of intentional using performance-enhancing drugs on April 24, 2018, and he was allowed to fight again. Dos Santos claims that USADA turned the last year of his life into a nightmare. Junior dos Santos is scheduled to face Bulgarian superstar, Blagoy Ivanov, at UFC Fight Night 133, on July 14, 2018. Junior dos Santos was married to Visana Piccozi, but the couple split up in January 2013 after ten years of marriage. There were rumors that his marriage was ended due to the affair with his current wife. Cigano got married for the second time to Isadora Santos, a television presenter in Brazil, in 2016. Their first child was born on March 9, 2017.